SAN ANTONIO (AP) The Spurs are without their two main leaders from last season, but they are not lacking in direction. Resurgent forward LaMarcus Aldridge and second-year player Dejounte Murray continue to lead the way as San Antonio remained unbeaten by fighting past Toronto. Aldridge had 20 points and Murray had 16 points and 14 rebounds and the Spurs held on to beat the Raptors 101-97 on Monday night. The Spurs are missing leading scorer Kawhi Leonard and Tony Parker, who are both rehabilitating from quadriceps injury. San Antonio has struggled to find an offensive flow without their veterans, but Murray is attempting to step into the void in just his second season. San Antonio needed that grit from the 21-year-old point guard in slugging through a physical game. Both teams were assessed 20-plus fouls and Aldridge and Serge Ibaka received technical fouls after an altercation with 3:36 remaining in the game. The two got tangled battling for position under the rim when Ibaka threw an elbow into Aldridge’s midsection. Aldridge would push Ibaka before the two were separated. Murray showed his growing comfort with a leadership role by taking Aldridge aside. Aldridge responded minutes later by drawing a sixth foul on Ibaka. Aldridge shouted in celebration and glared at a fallen Ibaka after driving to the basket and scoring on a layup to give San Antonio a 97-87 lead. The Spurs were able to overcome a season-high 20 turnovers. They were averaging 11 turnovers in their first two games, but had four in the opening four minutes. Toronto took advantage, keeping the game close despite being outrebounded 55-33 as it played without injured center Jonas Valanciunas. DeRozan had 28 points and Ibaka had 13 before fouling out as the Raptors lost their first game of the season. Raptors: Valanciunas missed his first game with a sprained left ankle. There is no timetable for his return, but the 7-footer said he expects to play during the team’s current six-game road trip. . Toronto, San Antonio, Golden State and the Los Angeles Clippers are the only teams with at least 48 wins in each of the past four seasons. … The Raptors have lost nine straight in San Antonio, last winning Dec. 28, 2007. … Toronto was San Antonio’s first opponent at the AT&T Center. . The Raptors waived F K.J. McDaniels on Sunday. McDaniels was inactive for Toronto’s first two games, but totaled six points, five rebounds and two blocks in three preseason games. Spurs: Danny Green had a career-high five blocks and San Antonio had 12 as a team. Green also scored 17 points. . F Joffrey Lauvergne exited with 9:19 remaining in the fourth quarter after spraining his right ankle. Popovich did not know the severity of the injury, but said it didn’t appear serious. . Anderson had a career high two blocks, both coming in the first quarter. … The Spurs had a 3-pointer for the 978th straight game, the fifth longest streak in the NBA. Raptors: At Warriors on Wednesday. Spurs: At Miami on Wednesday. 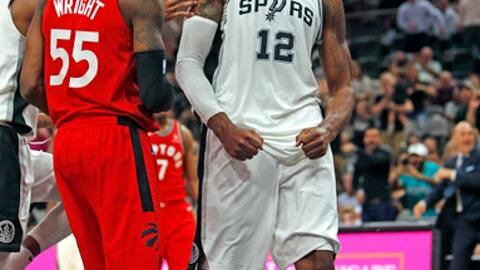 Murray’s 14 rebounds were the most by a Spurs guard since Ginobili had 15 against Toronto in 2008. ”It’s got to be a mistake,” Ginobili said, stunned. Ginobili was asked if he remembered when he could soar like Murray.